I was Praying near a medicine wheel at my Medicine Wheel and altar donned with a 6 foot stone. It was one of those hard days where I found myself huddled and humbled in tears looking for my center in Nature, something that I have done since I am a little girl. I gazed upon this rock and suddenly saw it in a new way. I grabbed my paints and brush and sage and follow the lines of an ancient age. Oh Mother Goddess I see you clear coming through with the gentleness of deer. My tears of rage have found no stage on this Altar pure that I gift you this day. 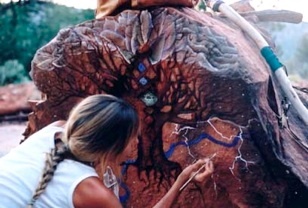 Mother Goddess was the first, painting my gift to her children and the Earth. Her Blue Corn promises life as She carries the Fire and Sun, and Full Moons light. Behold Her desire… creates a New World Higher. Standing to balance… sacred Love and scared dance. She, my gift to the Earth has given me a rebirth. Clearing my thoughts of seclusion, She lights my path, revealing illusion. Father God Tree of Life, standing not far off, to my right. The lines of old again I followed. Ancestor’s rhymes, and portals hallowed. The Tree of Life blooms a Lotus of light. Spirit rides on the back of an Eagle, holding the Masculine in balance. Harmony restores in song, art and dance.